Is that PR Gold in that E-mail, or Iron Pyrite? No doubt you’ve received that pay-for-play e-mail: a breathless offer to feature your organization on television, or interview your CEO or a doctor on a major healthcare podcast or website. 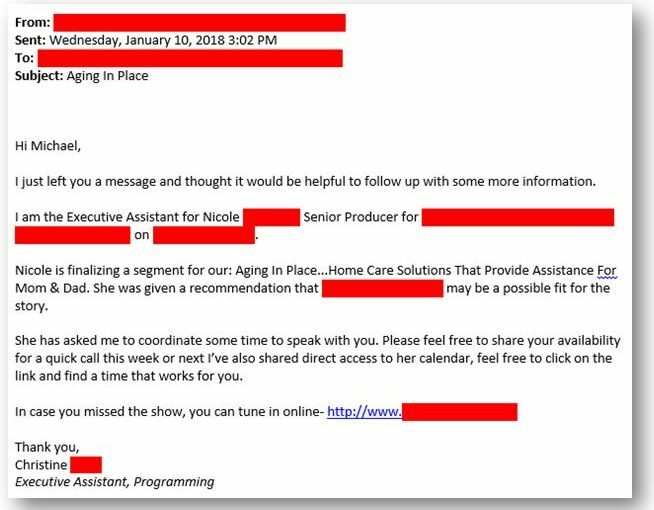 One such offer recently came to us through our home care client, inviting their participation in a segment on solutions for seniors aging at home. This was for a familiar TV lifestyle program on a well-known basic cable channel, owned by an even bigger entertainment company. At first read, it sounded legitimate; we’ve all seen these types of programs, and they interview people and gin up the latest innovations all the time. There were multiple follow-up calls and e-mails. But closer inspection revealed this was nothing more than pay-for-play…with a hefty five-figure “pay” element attached. This quid-pro-quo is nothing new. As mentioned above, we’ve all found them in our inbox, or maybe the junk mail folder. And there’s nothing particularly insidious about a programmer seeking money to say good things about your organization (or allow you to say good things) in front of a large audience. The trouble comes in the level of transparency, or lack thereof. Even reasonably intelligent people might not quickly discern the offer’s true nature right away, especially when it involves a recognizable or even a household name. We’ve even seen offers to interview a client’s CEO on a national news network, only to learn it’s a freelance former cable journalist who produces the video, then promises to place it – for a four-figure fee – on that network’s sub-site for citizen journalism. At first glance, such offers are appealing. But then that “too good to be true” skepticism kicks in. Why us? Why now? How’d they get my name? Unfortunately, by the time you find out there’s payment involved, some staffer has wasted time vetting the opportunity, or making a phone call with a long-winded “producer” or “programming assistant.” The proliferation of online media outlets continues to blur the line for both healthcare communicators and consumers themselves as to whether what they’re seeing is earned media or paid-for content. Worse yet, for all the short-term eyeballs, regularly engaging in pay-for-play opportunities could have a negative effect from a reputation management standpoint. Who among us bestows the same credibility on an advertorial as an earned media placement in a well-known media outlet? Conversely, some offers are, in fact, legitimate PR opportunities, so turning a skeptic’s eye on all of them might result in a missed golden opportunity. So what’s a harried communications professional to do? Read the e-mail closely. They might be a few paragraphs down, but you may find the words “symbolic payment,” “stipend,” or “small honorarium” involved. It may ask you to simply subsidize a production fee. But frequently, there will be no mention of remuneration anywhere in the initial outreach, as was the case with the cable lifestyle program. Look for an “Unsubscribe” link. A true journalist request won’t have one at the bottom, because it’s not needed. Only mass e-mails have to include an opt-out option. This isn’t a sure sign, however, as some savvy companies will send a personal, hand-crafted e-mail, and others simply ignore the law. See what others are saying. It won’t take much effort to find other professionals’ feedback on this company or that program. Those who’ve been misled or victimized are often quite vocal in online forums about their experience. When in doubt, solicit peers’ opinions on Linkedin or similar site. Remember, some offers might be worthwhile. That major online interview isn’t necessarily a scam, as you’re paying a professional to conduct a television-quality piece, edit it, then do the legwork of placing it, where it potentially will be seen by many people. Happens all the time, and some organizations find value in this kind of arrangement, particularly since many viewers aren’t aware they’re watching advertorial content (e.g. an infomercial), especially when it’s running in a medical practice’s waiting room. But again, it comes down to the level of transparency, and at what point the fees are revealed. Inform your front-line people. Make sure they aren’t dismissing true opportunities simply because they’re not familiar with the outlet, or the person making the request. You don’t want to throw out the golden wheat with the chaff. In a perfect world, pay-for-play come-ons would show their true stripes from the outset…but that’s probably not effective for their marketers. As healthcare communications professionals, it’s on us to vet such opportunities and counsel our clients before a C-level executive or star doctor gets visions of instant fame and easy national exposure in their head.